As you may have read on this very website, Arby's has gotten really good. You have to appreciate a chain that serves seared duck and deer meat. Its real showstopper, though, is and always will be that coil of potato and comfort, the structural and culinary marvel that topped our fast-food French fry ranking, the venerable curly fry. 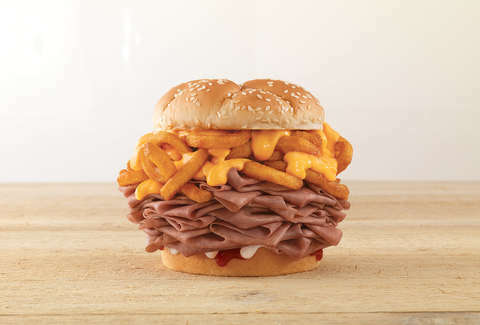 So we're pleased to report that Arby's is making the most of those fries and integrating them into a monster of a sandwich called the Arbynator. It's a stack of roast beef, curly fries, Cheddar sauce, Arby's sauce, Horsey sauce, and a sesame seed bun. It will fathom the depths of your appetite and, frankly, your character. The Arbynator is available nationwide as of November 19 in three sizes: classic, double, and half-pound. The double, as its name suggests, features double the meat of the classic; the half-pound, as its name suggests, weighs a half pound. To be clear, eating that third option should not be undertaken without serious reflection. Note, however, that this behemoth will only be available for a limited time (probably the civically minded decision). Chew Boom reports that it will be served nationwide only from November 19 to December 23. If this sandwich sounds familiar, that's because it made a test run in select markets back in 2017. Thankfully, Michigan and Oklahoma passed the test.